Is it just me, or does this image look like it came from a low budget science fiction movie, with a strange-looking alien creature hovering over a Martian landscape? I was chasing dragonflies again this past weekend, trying to capture images of them in flight, and ended up with this image of a female Common Whitetail dragonfly (Plathemis lydia). 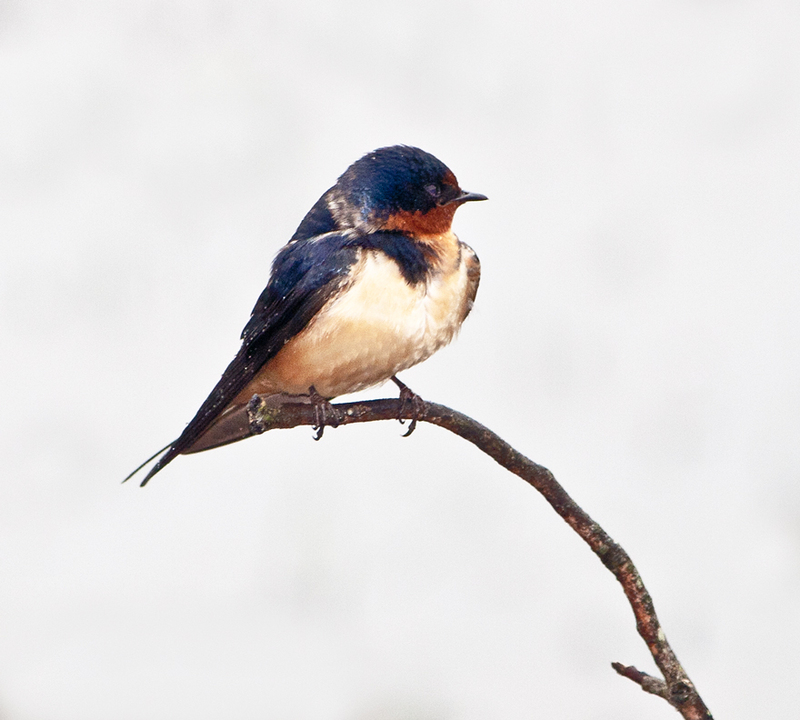 It’s pretty tough to try to track these flying insects with a hand-held telephoto zoom lens extended to almost 400mm. My autofocus seemed too slow and I adapted a technique of trying to focus manually, while trying to keep the lens steady. 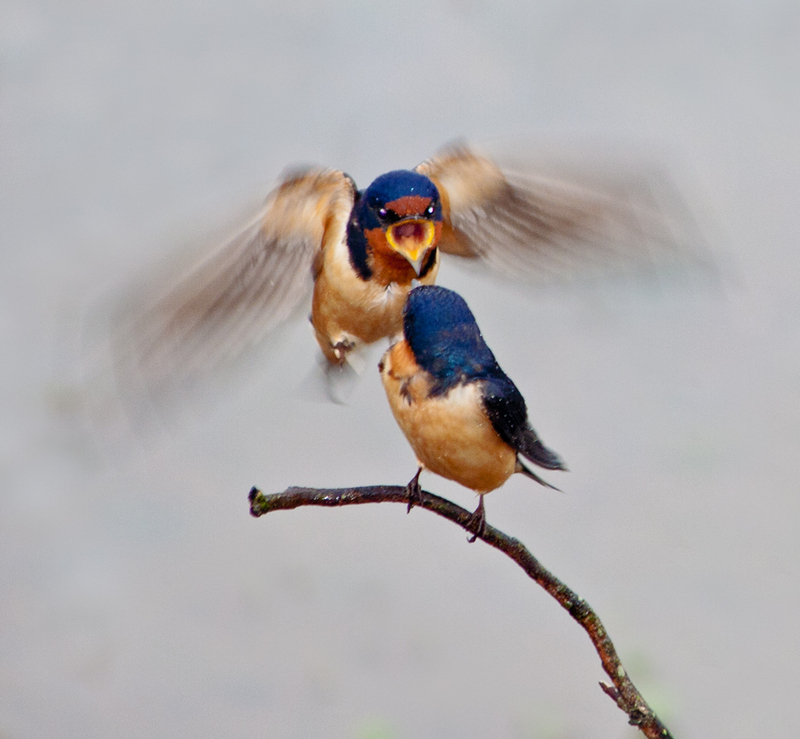 I can’t tell for sure if this image was auto-focused or was manually focused. 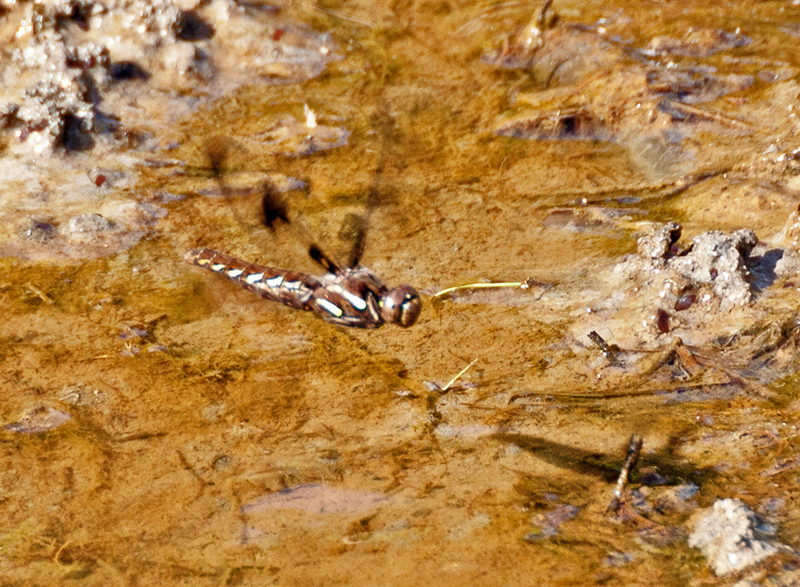 Female Common Whitetail dragonflies do not have a white tail and in many ways that makes them a little easier to expose correctly. 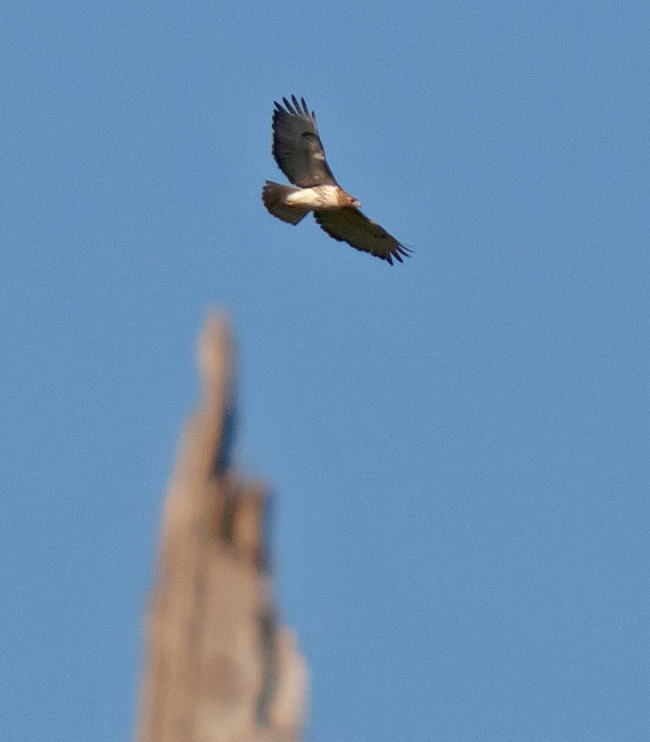 The wings are blurred, but you can still see the brown markings that identify this as a female, and not an immature male. Last summer I was content to get a shot of a dragonfly when it was stationary, but this summer I am going to work hard to capture some more images of dragonflies in flight. 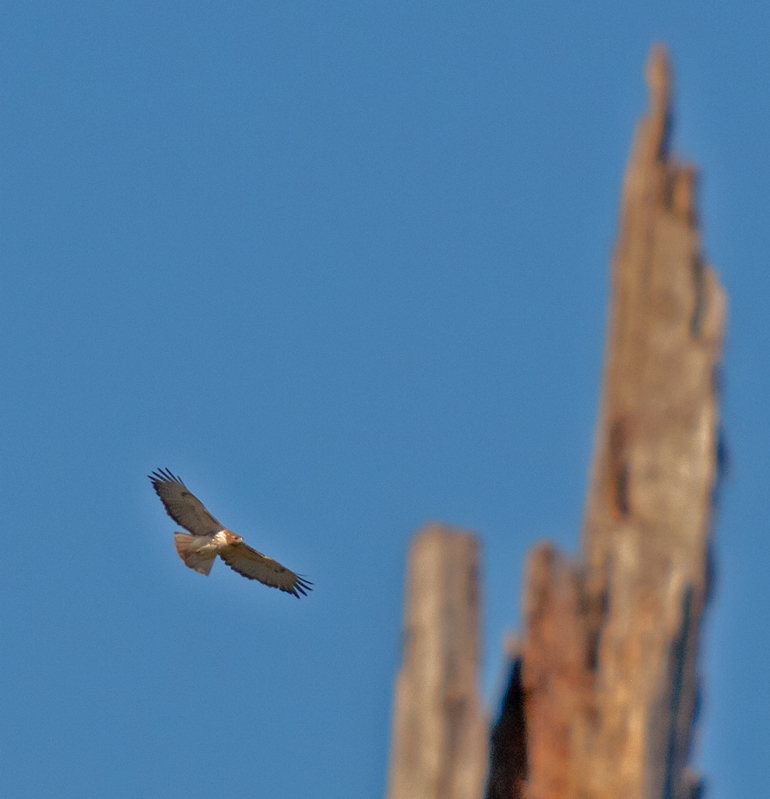 I haven’t seen many hawks in the last month or two, so I was delighted when I spotted this Red-tailed Hawk (Buteo jamaicensis) circling in the distance this past weekend. 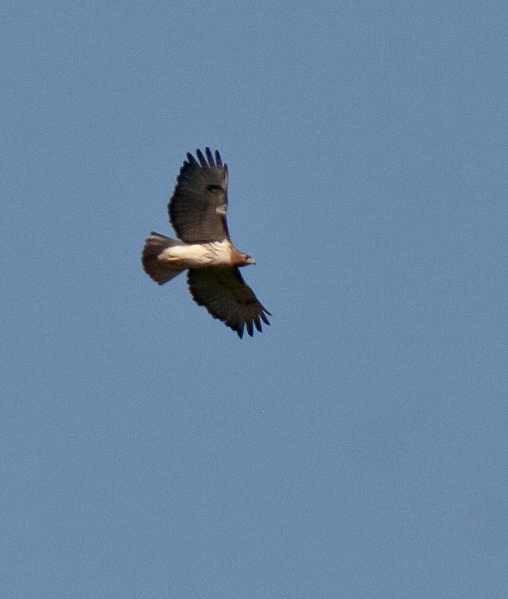 Most of the hawks that I had previously seen at my local marsh have been Red-shouldered Hawks, but I am pretty sure this one is a Red-tailed. 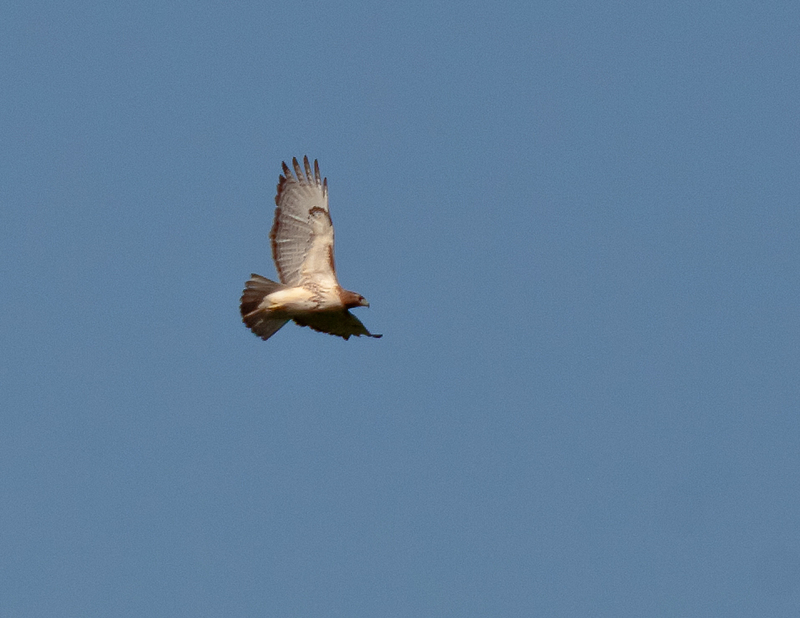 The hawk never came close enough for me to get a really good shot, but I am content that I was able to get some shots in which the hawk is recognizable as more than an indistinct blob in the distance. Several of the shots I am posting look almost like they have a rock formation in the background—it was only, however, a dead tree. These images are aspirational ones for me. They represent the kind of photographs that I am working to be able to produce in the future with greater sharpness and more pixels (I had to do a lot of cropping). They are a step on the path of my journey into photography. I was thrilled this past Saturday when I caught sight of this Green Heron (Butorides virescens), because green herons have only recently returned to the area after spending their winter in warmer locations. The lighting situation, however, was really problematic. There was beautiful dappled sunlight in the background, but the heron was mostly in heavy shade and his back was illuminated with harsh sunlight. I played around with a number of different settings and this was one of the better images. I still had to make some adjustments in post-processing to pull some of the details out of the shadows, which made the final image a bit grainy. 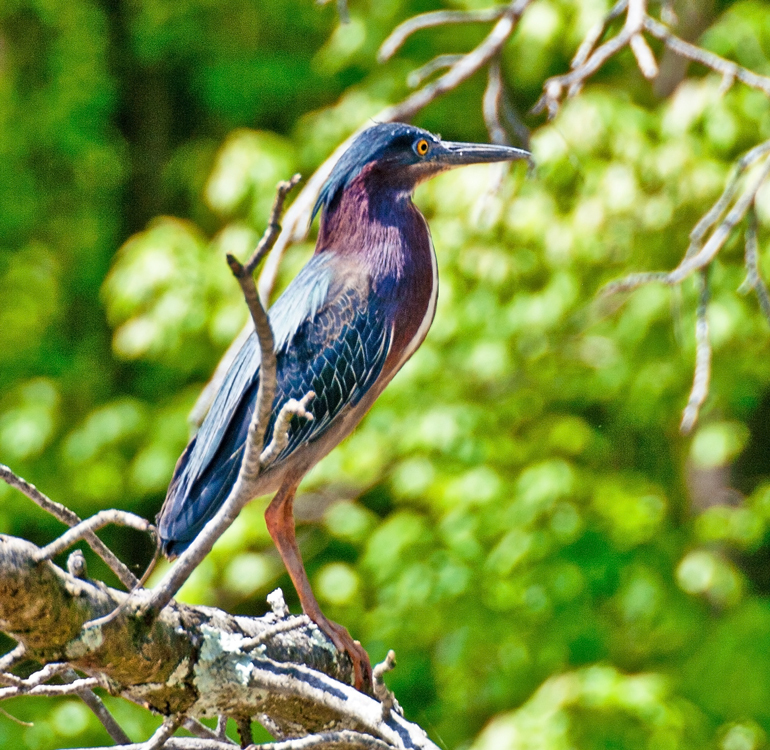 I really like the Green Heron’s pose, as he looks off into the distance. I don’t think that he was actively fishing, but was merely relaxing in the shade of the tree. The Great Blue Heron was too far away for me to capture many details, but the light early yesterday morning was especially beautiful, so I decided to pull back and try to capture the landscape, something that I don’t do very often. 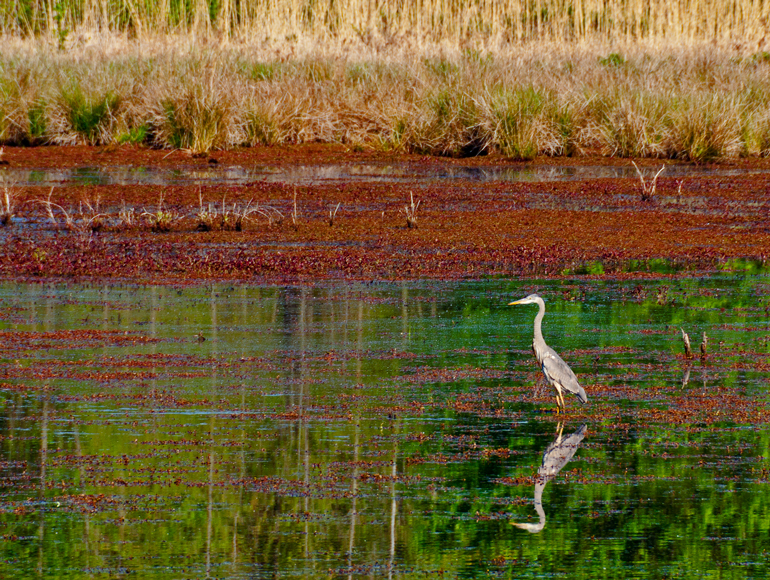 I love the rich bands of color that I managed to capture in this shot and the gorgeous reflections in the water at my local marshland park. The red color, I believe, is from buds that were stripped from the trees by winds and rain this past week. Snake eyes are often cold and menacing, but somehow this snake that I encountered yesterday seems to have warm brown eyes that look almost like he is smiling. 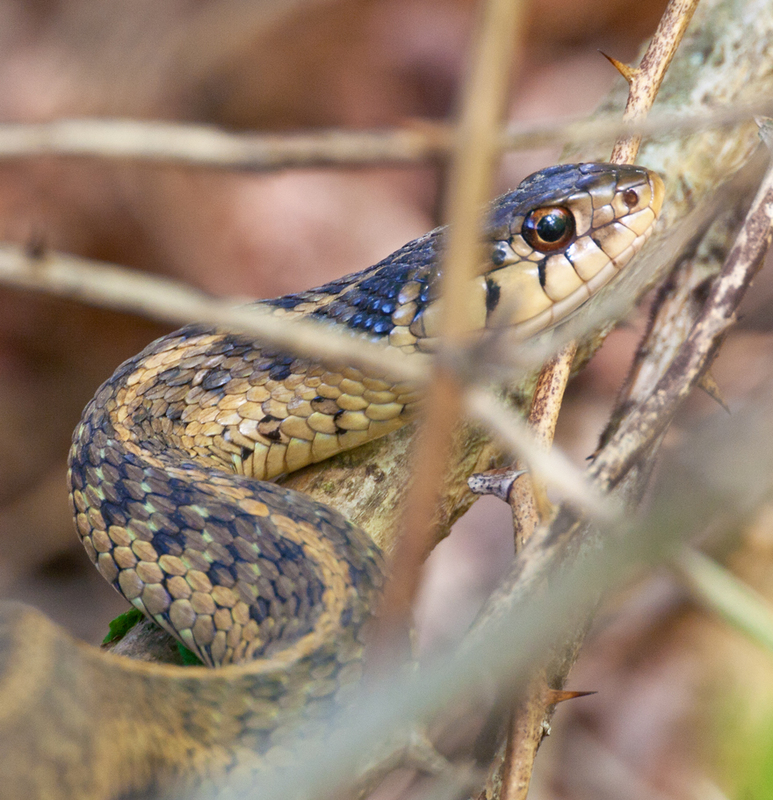 This snake, which I think is a Common Garter Snake (Thamnophis sirtalis), was curled up in some underbrush near the edge of the marsh. It was a real challenge getting a clear view of his head, the more so because I was using my 135-400mm lens that has a minimum focusing distance of almost seven feet (two meters). For this shot, I used my tripod so that I could get an exposure of 1/30 second at f/9, with the lens zoomed out to about 350mm. I like the fact that I was able to capture some of the beautiful texture of the scales on his skin. You can easily see how I had to look for little sight windows through the brush, which is mostly blurred and hopefully is not too distracting. Finally, I am happy that I managed to capture some of the sinuous curves that help to guide the viewer’s eye to the snake’s head.